Said to be the un-official historic capital of Malaysia, Malacca overflows with prominent attractions and tasty cuisine. Founded in the 1400’s by Sumatran prince, Parameswara, Malacca prospered as an international harbour due to its advantageous location. The Dutch Heritage Trails Tour takes you on a journey to experience the heritage and traditions that have made Malacca – which was inhabited by the Portugese, British and Dutch over a period of four years – what it is today. 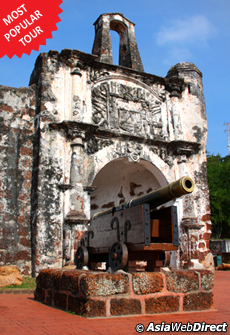 Remnants of their respective governments can be seen all over the town from the A-Famosa fort to the nearby Stadhuys and Christ Church. It goes without saying that a trip to Malacca would be imperfect without a leisurely walk down Jonker Street. This avenue which once housed wealthy and daunting residences has now become a bargain-hunter’s seventh heaven for antiques and food. On Fridays and Saturdays the street is wonderfully altered into a bustling, bazaar-like atmosphere with visitors swarming the thoroughfare looking for distinctive things to buy. Expenditure of a personal nature such as drinks, souvenirs, etc. Minor changes to the programme are sometimes necessary, we will endeavour to minimise these changes which are sometimes out of our control.